Global efforts are underway to develop staple crops with improved levels of provitamin A carotenoids to help combat dietary vitamin A deficiency, which has afflicted the health of resource-poor farmers in the developing world. As a staple crop for more than 500 million people in sub-Saharan Africa, cassava enriched with provitamin A carotenoids could have a widespread nutritional impact. Because cassava is the second most important food crop in Uganda, a breeding programme was initiated to develop provitamin A varieties, with some clones already tested in advanced yield selection trials. A survey was conducted to understand gender-based constraints and opportunities governing farmers’ decisions to grow yellow-root cassava in Busia, a rural district in eastern Uganda. Logistic regression was computed to determine predictors of willingness to grow yellow-root cassava. Men, women and youth involved in this study were all aware of a yellow-root cassava landrace popularly grown in eastern Uganda, with at least 85% of each group actively growing the cultivar at the time of this study. Interestingly, both men and women singled out early maturity and high fresh root yield as attributes influencing their preference for the yellow root. An assessment of household participation in cassava production and processing activities showed that women performed the bulk of such activities, with men particularly involved in land preparation and selling of products. Nonetheless, both women and men showed strong indication of acceptance and willingness to cultivate yellow-root cassava, which is an incentive for potential uptake of such varieties in future. However, there was poor knowledge on the nutritional benefits of yellow-root cassava, suggesting need for nutritional education when disseminating improved provitamin A cassava varieties. The study provides strong motivation towards breeding provitamin A cassava varieties that have farmer-preferred traits in the background of disease resistance, an output that could be attained through undertaking participatory variety selection trials. Cassava (Manihot esculenta Crantz) is a starchy crop grown and consumed widely in tropical regions of Africa, Asia and Latin America, where it dependably provides food, non-food uses and income to the populace involved in its production and marketing. Globally, at least 800 million people derive the bulk of their dietary energy from cassava on a daily basis; of these, an estimated 500 million people live in sub-Saharan Africa (SSA) [1, 2]. Currently, cassava is grown on an estimated 17 million hectares in SSA alone, making it the second most widely cultivated crop after maize in the region . In fact, acreage under cassava is expected to increase , which testifies the crop’s importance and leverage on the continent. In Uganda, for example, a total cassava production of 3.42 MT in 1990 was obtained from 412,000 ha. Fourteen years later (2004), the production increased to 5.5 MT from 407,000 ha. As of this writing, area under cassava production in Uganda had increased to 850,000 ha, but production decreased remarkably to 2.81 MT . It suffices to note that this trend of a declining production reflects a myriad of production constraints occasioned by the complexity of pest and disease epidemics , rapid changes in climatic conditions , limited agricultural extension services  and slow commercialization and/or mechanization development [8, 9]. Moreover, the starchy roots, though hugely popular for food, are inherently deficient in micronutrients such as vitamin A . For example, Stephenson et al. reported that consuming cassava as a staple food places children aged below 5 years at a risk of inadequate protein and vitamin A intake. Clearly, if the malnutrition challenge is allowed to continue, it will create room for a huge economic burden for future generations. Accordingly, global efforts have been made to bio-fortify cassava, targeting the development of varieties with elevated levels of provitamin A carotenoids, primarily to help reduce prevalence of vitamin A deficiency (VAD) in subsistence-farming systems . Consumption of carotene-rich cassava would become home-grown therapies for sustainably improving nutrition in communities whose dietary needs heavily depend on the crop [13, 14]. Similar interventions have been successfully implemented with several advanced cultivars of maize, wheat and beans tested for on-farm production . Most recently, recognition of the impact of biofortification of staple crops climaxed at the award of the 2016 World Food Prize to team of researchers that implemented development and dissemination of provitamin A sweet potato varieties. These success stories are strong motivations for biofortification of cassava, a crop of immense importance for food security in subsistence systems in SSA. Indeed, National agricultural Research Organisation (NARO) of Uganda initiated breeding efforts tailored towards the development of high-yielding provitamin A cassava varieties . Some of these improved clones are being tested by National Crops Resources Research Institute (NaCRRI) for prospects of commercial release . Fortunately, communities across cassava-growing regions of SSA have demonstrated strong willingness to produce and consume yellow-root cassava. A case in point was observed in Kenya, where primary school children aged between 7 and 12 years were keen on having meals of yellow root . Relatedly, at least six carotenoid-rich cassava varieties have been released for commercial production in Nigeria, with farmers expressing substantial willingness to grow them . Certainly, these studies strongly demonstrate that when farmers are provided with technological options, they will make informed choices. However, global acceptance of biofortified crop varieties depends on an array of factors, with high adoption reported for varieties identified through participatory selection schemes . It is commonplace that men, women and youth participate in cassava production to meet diverse needs; thus, preferences for varietal characteristics tend to vary among these social groups [21, 22]. Such variations in farmer perceptions and attitudes towards crop varieties are critical considerations when targeting to deploy improved cultivars [23, 24]. Therefore, the current study was undertaken to understand gender-based constraints and opportunities that govern farmers’ decisions to grow yellow-root cassava in Busia, a rural district in eastern Uganda. Specifically, we answered the question on whether or not differences existed among men, women and youth in preference for traits in yellow-root cassava. This information is critical for key stakeholders involved in promotion and/or dissemination of improved cassava varieties. The study was conducted in Busia district, eastern Uganda. Busia is located between latitudes 00°28′14″N and longitudes 34°05′31″E. Busia is a major cassava-farming district bordering western Kenya, an equally major cassava-growing region. Qualitative and quantitative tools were used to collect data from men, women and youth in Bulumbi and Dabani sub-counties, with specific focus on prevalence of yellow-root cassava. Sampling frame was derived from a list of smallholder farmers provided by the Production Department of Busia. From each sub-county, a parish with the largest number of farmers and cassava production was selected. A total of 40 participants from each parish were purposively sampled with deliberate efforts to ensure equal representation of men, women and youth. Study tools were peer-reviewed and pretested prior to data collection. Initially, focus group discussions (FGDs) were conducted such that the respondents were disaggregated into three groups: men, women and a mixed group comprising of men and women. The target size for each FGD was 10 individuals, and it was assumed that some invitees would not respond, while in other cases, residents of the village that had not been invited would show interest and join the group discussion. In fact, in the case where there were an appreciable number of households not actively farming in the village, the list was filtered first to remove those households before the remaining were used for random selection. In some cases, other people joined the focus group, usually village elders or decision-makers. No participant belonged to more than one focus group. Raw data from each focus group were recorded in notebooks and flipcharts following a predetermined study guide. A lot of steps and precautions considered while undertaking the FGDs were adopted from guidelines provided by Freistas et al. . Other observations and images were recorded. All discussions were voice-recorded to supplement responses written in notebooks. Further information on cassava production in Busia was obtained from focal persons through key informant interviews (KIIs). In this case, four men and two women, who included agricultural officers and experienced cassava farmers, were interviewed. These key informants were regarded to be community experts with first-hand knowledge and ability to provide deep insight into cassava production dynamics in the study area. Together, information from FGDs and KIIs was used to develop semi-structured questionnaire for collecting quantitative data through household interviews. A purposive sample of 81 farmers, representing equal proportions of men, women, male youth and female youth, were interviewed such that each household contributed only one respondent. Caution was taken not to interview participants of FGDs and KIIs. Qualitative data from FGD and KII were analysed using content analysis approach described by Elo and Kyngas . Initially, all responses were examined and coded to generate themes clustered by categories to capture a gender-disaggregated understanding of aspects of yellow-root cassava production. Information generated was then analysed separately for men, women and youth following the generated themes; this was done for each site where FGDs were conducted. Finally, a comparative analysis was conducted across sites by means of cataloguing the evidence collected and resultant themes rated in terms of relevance and consistence to reach conclusions of the study. Supplementary information recorded during discussions was used as additional reference materials during transcription. Meanwhile, quantitative data generated from the 81 individual household interviews were cleaned and coded for statistical analyses using STATA v13 . 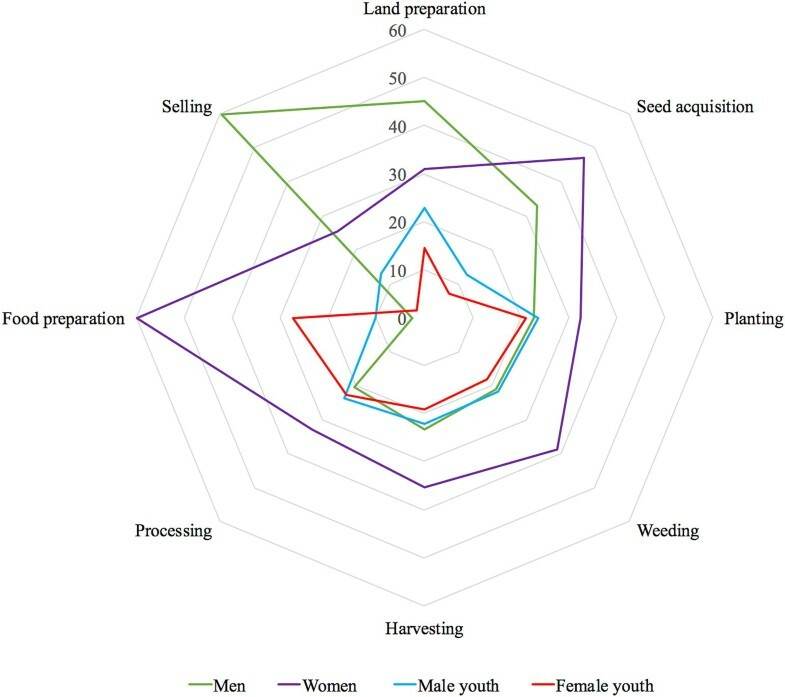 Differences and associations for gender roles and gender perceptions on production, processing, consumption and marketing of yellow-root cassava were assessed using Chi-square tests. Logistic regression was computed to determine predictors of knowledge on yellow-root cassava . Majority (63%) of respondents were married; only 34.5% were single (Table 1), an essential piece of information that determines extent of participation in decision-making along the production–processing–marketing continuum. With regard to education levels, 45.7% of respondents attained primary education, while 40.7% attended secondary education, highlighting a drop of ~ 5% for the primary to secondary education transition for the community. Meanwhile, 6.2% of the people interviewed did not attend any formal education. As initially targeted by this study, most households (85.2%) were primarily engaged in crop farming and 11.1 were students. The respondents had on average spent 24 years in the community. Overall, cassava landraces were predominantly grown by farmers in Busia. For example, cultivar “yellow”, which is a yellow-root cassava landrace, was the most popular across all the gender categories in Busia; strikingly, 100% of the female respondents grew “yellow” (Table 3). Indeed, improved cassava varieties (white-fleshed) released under the nomenclature of “NASE” were grown by few of the respondents, except for NASE 3 that had relatively high frequency among men (45.0%) and women (47.6%). Other common cassava cultivars grown in Busia included “magana”, “mercury”, “lodelado”, “dodo” and “mufumba chai”. Overall, the relationship between varieties grown and gender categories was non-significant (X2 = 78.7; P = 0.454). Again, these findings clearly illustrate non-specific preference of cassava varieties by men, women and youth, i.e. a variety is universally accepted by the community. “Yellow helps us to overcome hunger in a short time because it takes about 8 months to mature, produces 10–12 roots per plant and yields higher than other varieties in the same garden”. Relatedly, women recounted that “we like the yellow color of its roots and food prepared from those roots makes one easily satisfied. Also, less amount of flour is required to prepare sufficient food for the family because its flour easily absorbs water; in addition, the floor from it has a nice aroma”. Compared to their male counterparts, female youth showed stronger preference for early maturity, high fresh root yield, good flour quality and tolerance to diseases. Overall, men and the male youth showed high preference for shorter maturity time, while women and female youth tended to prefer the yellow cultivar because of its high root yields. Meanwhile, preference for flour quality was highest (40%) among the female youth (40%) and least among men (16.7%). Drought tolerance was another preferred attribute marginally mentioned by respondents, notably male youth (11.1%) and men (5.3%). Similarly, extended shelf-life was considered marginal as reflected by 5.6% of the male respondents; other respondents hardly mentioned it (Table 4). On the other hand, some qualities of the “yellow” cultivar were considered poor and thus disliked by farmers in the different gender categories. Top on the list of poor qualities was low dry matter content and bitter taste of fresh roots, with more than 55% of respondents expressing dislike for these traits (Table 4). Ironically, 50% of women respondents indicated disease susceptibility as a poor quality attribute, contrasting the results under good quality attributes. Similarly, low root yield was regarded as a poor attribute by 18.9% of the respondents, which again, contrasted with its good attributes highlighted above. Relatively larger proportions of women (30%) and female youth (20%) considered poor storability of roots in soil as a major drawback of the “yellow” cultivar. Overall, men and women had similar opinions on poor quality attributes of cultivar yellow during FGDs. For example, men said that “Yellow is not good for in-soil storage, so one cannot do piece meal harvest. Yellow also has watery roots, which shrink during drying. In fact, roots of Yellow are bitter and cannot be eaten fresh, as they make our stomach pain”. Similarly, women narrated that “yellow has watery roots that take several days to dry, especially during wet season. Further, its roots are bitter when eaten fresh, do not stay long in the soil and the plants are susceptible to pests and diseases”. Overall, women were more engaged in the bulk of cassava production activities than any other gender group. In particular, women were largely involved in sourcing planting materials, planting, weeding, harvesting, processing and food preparation (Fig. 1). In parallel, men were largely involved in land preparation and selling of cassava produce. In general, the youth played supportive roles to both men and women, with female youth more involved in food preparation, while the male youth largely participated in land preparation. Relatedly, it was noted that decision-making on which varieties to grow varied among the different gender groups. Results of the logistic regression indicate that female youth were six times more likely to grow yellow-root cassava than any other gender group (Table 5). Married people were also more willing to grow yellow-root cassava than those who were not married. Relatedly, respondents that attained secondary education were six times more likely to cultivate yellow-root cassava than those who only attended primary education. Empirical data to demonstrate the resilience of cassava in Africa revealed that the crop will be more positively impactful in many areas of Africa than other staples [4, 29]. This is a positive outlook, although it also presents some intrinsic challenges. Diets that heavily depend on starchy staples such as cassava are highly vulnerable to VAD. Indeed, such micronutrient deficiency problems are commonplace in peasant families, where nutritious foods in the form of animal products, fruits and vegetables are very rare . In extreme cases, severe VAD in children and women of reproductive age increases their susceptibility to preventable diseases . Worse still, in remote parts of developing countries (including Uganda), interventions to minimize VAD through use of supplementation and/or food fortification are not practical. It is this landscape of challenges that strongly justifies the urgent need to breed and deploy nutrient-rich crop varieties to vulnerable communities . Such concerted efforts will contribute towards attainment of sustainable development goals particularly, goal 2 that focuses on improved nutrition and promotion of sustainable agriculture. Thus, this pioneer study sought to gather information on knowledge and perceptions of men, women and youth on yellow-root cassava, to provide frameworks for systematic varietal development and eventual deployment of improved provitamin A cassava. It is understood that, among the key constraints facing cassava production, participation of men and women produces different benefits and gains across the entire value chain . For this purpose, this study was conducted in Busia, where yellow cassava varieties had been reported before . Indeed, results indicated that crop production was the most important economic activity in Busia, with cassava as the most predominant crop cultivated in the district. An important feature of the study area was the active engagement of youth in cassava production, which is acknowledged to help eliminate generation gap for sustainability of the food supply chain . Maize and sweet potato were other crops commonly grown for food in Busia, which indicated heavy reliance of diets on starchy staples and thus increased vulnerability to VAD. Effectively, Busia would be a primary target for potential dissemination of provitamin A cassava varieties in future. Despite the high economic value of cassava, most cultivars grown in Busia, including the yellow-root type, were landraces. Although some Ugandan farmers tend to continuously cultivate landraces for various specific traits, such cultivars are often highly susceptible to diseases  and thus leading to low on-farm productivity. Busia is noted to be among areas with high incidence of CBSD , and continuous exposure of such landraces to the viral diseases could result to widespread crop failure and ultimate food insecurity in the area. Such a situation illustrates an opportunity to amplify efforts towards dissemination of improved cassava varieties to enhance production in areas with low access to such varieties. Good qualities associated with the landraces, particularly the “yellow” cultivar, were listed. Overall, men and male youth had preference for early-maturing cassava, while women and the female youth expressed strong preference for high-yielding cultivars. These trends are a probable reflection of social differences between men and women owing to the economic values they attach to cassava. It is very likely that men largely produce cassava for commercial benefits, which relates well to their role in selling the produce from cassava. Meanwhile, women tended to attach more value to food security, as reflected in their preference for high root yields and participation in processing roots for food. However, such socially constructed gender roles and household relations have also been reported to limit women’s participation in commercial cassava production in Nigeria and Malawi . Such results indicate an overall need for development projects targeted to enable women benefit from agricultural markets. On their part, plant breeders could exploit improved genetic stocks with good attributes to develop provitamin A cassava varieties for wide adoption across different gender groups. Alternatively, elite germplasm could be accessed from elsewhere and evaluated for possible adaptation and adoption after successful evaluation. Results further indicated that none of the respondents associated yellow-root cassava with nutritional benefits of vitamin A; the low education levels and/or lack of publicity campaigns on the nutritional value of yellow-root cassava may explain this observation. Iglesias et al. and Chávez et al. have previously demonstrated the effectiveness of using root colour to select for high carotenoids content in cassava. More recently, Njoku et al. and Esuma et al. reported higher total carotenoids content in yellow-pigmented cassava roots than in white-cream roots. Carotenoids such as beta-carotene are precursors to vitamin A. The ability to discriminate cassava varieties visually would be an incentive to farmers, as nutritious cultivars would be easily distinguished using the root pigmentation. In fact, this practice has proved to be helpful in dissemination of orange-fleshed sweet potato [20, 37]. Inevitably, future efforts targeting dissemination of yellow-root cassava will need to adopt multi-stakeholder approach to incorporate nutrition education as a strong and integral component of such programmes. Accordingly, women and female youth need to be a major focus of such nutrition interventions, as they tend to be more engaged in cassava production and processing, including key activities such as seed acquisition and food preparation. Despite this, respondents were able to identify some positive attributes of yellow-root cassava, notable of which included early maturity, high fresh root yield and tolerance to drought. Such diversity in farmer-preference attributes justifies the need for undertaking participatory variety selection mindful of gender dynamics in such communities, as farmers are aware of their preferences. Men, women and youth engaged in this study noted two poor quality attributes of yellow-root cultivar grown in Busia and should be primary considerations for cassava-breeding programmes targeting to deploy improved varieties. Firstly, the low dry matter content, which negatively impacts on processing output and flour quality. The tendency of low dry matter content in cassava roots with high levels of carotenoid content has previously been reported by [36, 38]. In Latin America, this negative relationship is non-existent owing to germplasm and evaluations methods employed . Breaking these negative correlations constitutes a major research gap that is currently being addressed. Secondly, the bitter taste of fresh roots of cassava is a probable reflection of high cyanogenic potential, which results in accumulation of high levels of hydrogen cyanide when cells are crushed or bruised; it is a toxic biochemical compound that accumulates in some genotypes . Bitter cassava roots will need to be processed, mainly through fermentation and/or sun drying, to reduce the cyanide content to non-toxic levels before consumption. Unfortunately, the high labour requirements for such processing methods tend to rest on women and youth, limiting their time for other necessary socio-economic activities . Besides, the processing methods to remove hydrogen cyanide are associated with significant reduction in carotenoid content in the roots, essentially reducing the nutritional benefits to the target consumers . For cassava biofortification to yield meaningful results and create the desired nutritional impact, it is imperative that provitamin A varieties targeted for release have non-toxic levels of hydrogen cyanide to encourage consumption of roots with minimal processing, such as boiling. This study reports a pioneer effort to dissect gender constraints and opportunities for cassava production and utilization in Uganda, with particular focus on yellow-root cassava cultivars. Though data were generated from few respondents relative to, three key findings were apparent: (1) a general acceptance and willingness among men, women and youth to cultivate yellow-root cassava; (2) trait preferences of provitamin A cassava were largely similar among men, women and youth, with early maturity, high fresh root yield and high dry matter mentioned as the most desired attributes; and (3) need for specially designed educational campaigns on the nutritional benefits of yellow-root cassava, which should further guide processing methods in order to realize intended benefits to consumers. Importantly, these results provide strong motivations towards breeding provitamin A cassava varieties that have farmer-preferred traits in the background of disease resistance, an output that will be attained through undertaking participatory variety selection trials. Equally important is the urgent need to broaden the scope of the study, being mindful of the entire cassava value chain actors. WE designed the study and wrote the manuscript; ARN developed the study tools and edited the manuscript; RM provided technical guidance and reviewed the manuscript; SA analysed data and edited the manuscript; RSK provided in-depth review and edited the manuscript. All authors read and approved the final manuscript. The authors are grateful to the technical staff of NaCRRI that administered the questionnaires to capture required data from respondents. Furthermore, we thank the gender experts implementing the GREAT Project for their technical guidance during design of this study. Data that support findings of this study are available upon request through the corresponding author. This study was jointly supported by funds from the Next Generation Cassava Breeding project (www.nextgencassava.org) and the Gender Responsive Researchers Equipped for Agricultural Transformation project (www.greatagriculture.org). FAOSTAT. Food and agriculture organization of the United Nations statistics. 2016 10 April 2017; http://data.fao.org/ref/262b79ca-279c-4517-93de-ee3b7c7cb553.